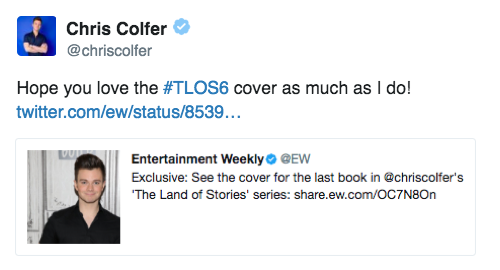 We now know the title of TLoS6: Worlds Collide. 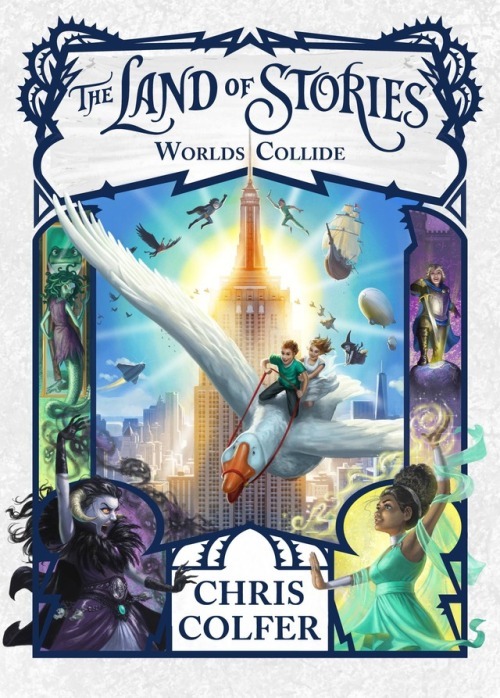 After five years of adventures, The Land of Stories series is finally wrapping up, with author Chris Colfer set to publish the last book this summer. The Land of Stories: Worlds Collide, the highly anticipated conclusion to the best-selling book series, once again follows siblings Connor and Alex as they deal with the various fairy tale heroes and villains no longer being confined to their worlds. So with trouble brewing in New York City, the twins must figure out how to right the balance of the human and the fairy tale world. In celebration of Colfer concluding his popular series, EW exclusively presents the cover for the upcoming novel, below. The Land of Stories: Worlds Collide hits bookshelves July 11. Preorder it here. The art work is stunning. I can't wait to get this book. Love the cover. Can't wait to get it but then so sorry it will be over. Pre-ordered mine. Just a month to go! Should be pre-ordering mine next week. June 12 Book Tour dates and he is going to 20 states. But that should be 20 book stores I guess. For fans of The Land of Stories series, the release of the final book is a great-but-painful moment — especially for actor and author Chris Colfer. His New York Times best-selling fantasy books have overtaken the YA world, and Colfer will celebrate the publication of the sixth and last novel, Worlds Collide, with a 20-city tour starting next month. The Land of Stories series, which first entered the bookshelves and imaginations of kids in 2012, follows the adventures of twins Alex and Conner who are transported from the modern world to a place filled with the magical characters normally only encountered in fairy tales. In Worlds Collide, the siblings have to deal with their biggest challenge yet — there is no longer any separation between the human and fairy worlds. He shared an exclusive look at the back cover with PEOPLE. The Worlds Collide book tour begins on July 11 (the publication date) at Barnes & Noble (Union Square) in New York City. It ends on the West Coast on July 30. If you’re dying to attend the book tour, then you should track Colfer’s social media accounts. He promises to share details about the tour the week of June 12. In the interim, delve into the novels, picture books, and in-world chapter books that make up The Land of Stories universe. A graphic novel, which will be a new take on Goldilocks’ story, is also in the works. Monday, June 26: Guests include Chris Colfer, Pharrell Williams, and Vince Staples. 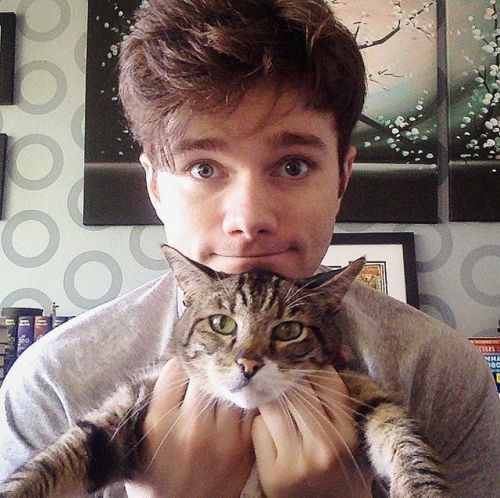 Chris Colfer is a Golden Globe-winning and Emmy-nominated actor best known for playing Kurt Hummel on Glee. He became a New York Times best-selling author with the publication of his first book, 2012’s The Land of Stories: The Wishing Spell. The sixth book in the series, The Land of Stories: Worlds Collide, will be published on July 11. The Land of Stories: Worlds Collide is #5 on the CHILDREN’S FRONTLIST FICTION list, selling 5,542 copies and bringing the book to a total of 72,583 copies sold thus far.